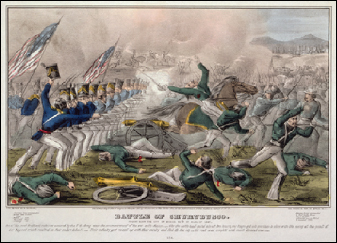 FGS & NPS: Mexican War indexing! Join in indexing the Mexican War records! The Legal Genealogist needs your help. Actually, we all need to step up and help each other, because what’s being launched by the Federation of Genealogical Societies is going to help anyone who has an ancestor who fought — or may have fought — in the Mexican War. Yesterday, the Federation of Genealogical Societies (FGS) and the National Park Service’s Palo Alto Battlefield National Historical Park announced a partnership to develop a searchable database of more than 130,000 soldiers of the U.S.-Mexican War. Any interested volunteers — and particularly any societies and groups — willing to join in the effort can contact Project Coordinator Patricia Rand, The Villages, FL, at [email protected]. The end result, if all goes well, is going to be a really useful tool for genealogists. It’s going to let us search individual soldiers, unit histories and more: the plan is to include not just the men who fought, but unit histories and even digitized documents. And it won’t just be limited to those who fought for the United States: names and information about Mexican soldiers will also be included. In fact, we’ll be able to use it just the way we can now for Civil War soldiers from both sides on the Civil War Soldiers and Sailors system database. That database — also online at the National Park Service — was also created through a joint effort of the National Park Sertvice and FGS. In that 1999 joint project, FGS volunteers completed data entry for more than five million names — and we all get the benefit now. So why did I start out saying I needed your help? Because — sigh — there’s something in particular that I hope to learn from this. Remember that rascal second great grandfather of mine? George Washington Cottrell? The one who marries and then promptly gets indicted for bigamy?1 And later for assault, and gaming, and even murder?2 That George? He also filed for a Mexican War pension. But without a comprehensive index to the service and unit histories of more than 130,000 soldiers of the Mexican War, I can’t be 100% sure that George was making things up. But with that index, and a chance to check out all the other names that come up in his pension file, I may just be able to put the question of did-he-or-didn’t-he-serve to rest for once and for all. Thanks for your support and rallying cry to the genealogy world! We’ll keep a special eye out for George as we work through the records. Can’t wait to see the new database, Pat! I use the Soldiers and Sailors database all the time, and am so grateful to FGS for its role in creating it. Hopefully FGS will post how we can help on their blog The Voice. I have intermittently been involved in Family Search Indexing, and would be happy to help with this project, and our Society president has already contacted Patricia. I am hesitant to e-mail Patricia individually, for fear she will be buried! I too have an ancestor that family legend says served in the war, but it may have simply been an excuse for his absence – haven’t had much luck finding him. I’m sure there will be a lot more details available as as time goes on, and a system for individuals to be able to contribute. Thank you so much for your willingness to help. It is greatly appreciated! We are in the process of creating a webpage with more details, but you will still need to contact Pat to volunteer.